Character is the seed that produces the fruit of high achievement. Most police training programs focus on competencies, yet almost all of our problems pertain to character. *Immediately after your purchase, you will be able to download the full 54-minute video in mp4 format. As the cornerstone of the Police Dynamics program, the Dynamic of Authority is critical for effective law enforcement. Most instances of police misconduct are the result of ego-driven officers operating “out from under authority.” Faithfully representing the authorities over you and remaining under their protection is key to avoiding negative consequences and building essential trust-based relationships. All of the lawful authority necessary to accomplish the police mission has been delegated to you and your officers. This dynamic explores how easily officers give away their lawful authority and resort to ego-power. *Immediately after your purchase, you will be able to download the full 56-minute video in mp4 format. 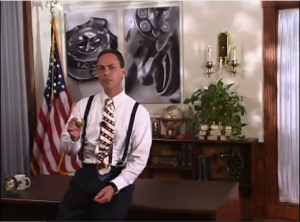 The Dynamics of Character and Authority are the full content of the same training that I have presented to over 10,000 law enforcement and government officials from all over the world…! 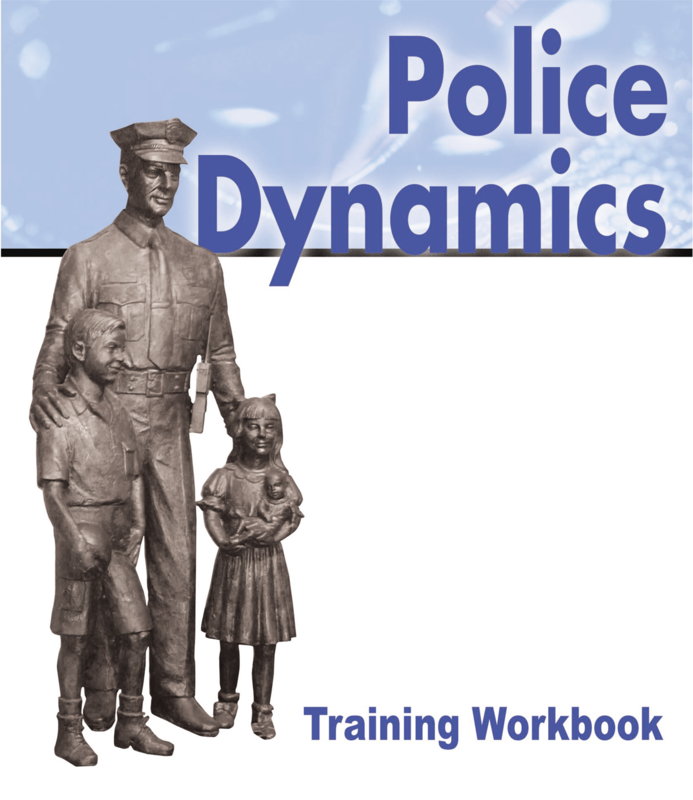 The Police Dynamics Video Training Series contained in our Premium Package is accompanied by a comprehensive student workbook. To give you a more robust training experience, I have included the entire workbook with this Basic package. The workbook utilizes an innovative instructional format that I call Dynagrams, which are graphic depictions of the various dynamics. While watching the videos, you have the opportunity to complete the Dynagrams in the workbook as I present them on the Powerpoint display. This highly interactive experience has proven to be a very effective training methodology for facilitating recall and understanding. Please refer to the appropriate pages that cover the Dynamics of Character and Authority while watching the training videos. *You will be able to download the workbook in pdf format. *You will be able to download this video in mpg format. The Dynamics of Coactivity and Strongholds are integral components of the Police Dynamics program that include practical strategies for taking back crime-ridden neighborhoods called criminal strongholds. The worst stronghold we had in Dorchester County was Stratton Capers. I knew Stratton Capers was going to be a challenge as soon as I realized that all of its streets were named after famous criminals! Dillinger, Dalton, and Younger were all street names in the neighborhood. Even the subdivision itself had a criminal name – Capers! So we implemented a “Battle Plan” based on the principles of Police Dynamics to take back this stronghold. We called it CRASH – Community Response Against StrongHolds. 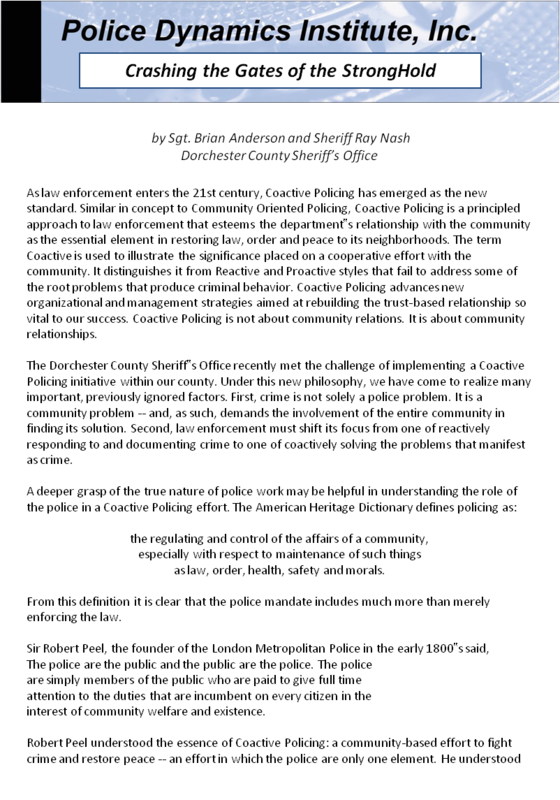 This 4-page report, the same resource I use during live Police Dynamics training sessions, chronicles our approach, the principles we implemented, and our success in reclaiming this criminal stronghold. *You will be able to download the bulletin in pdf format. I have trained police officers from all over the world for the last 15 years in the principles of Police Dynamics and I LOVE doing the training with a live audience. But now that I’m in Afghanistan serving with the International Police Coordination Board, making these sessions available by video is the closest I can come to live training. So take advantage of this offer now. The Tarnished Badge video is an excellent resource for a short training session before a team goes out on patrol. 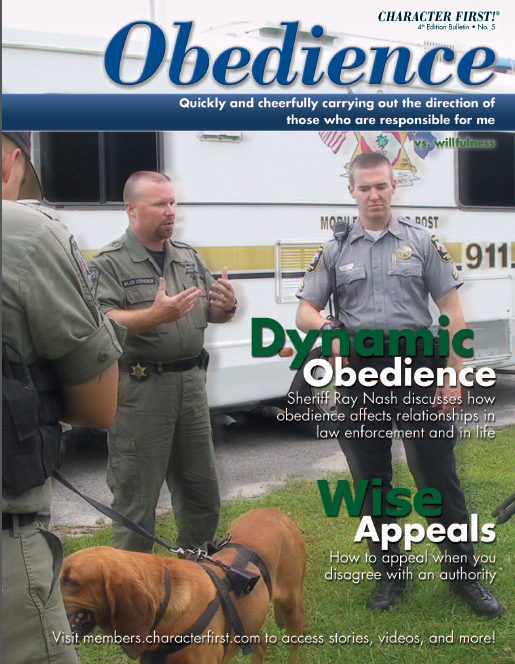 The Obedience Bulletin is also a great source of information that can be easily incorporated into a shift briefing. Plus, the Dynamics of Character and Authority can be broken down into shorter segments for roll-call training as well. Join other agencies such as the Grand County Sheriff’s Office in Colorado that have implemented Police Dynamics as an integral part of their pre-service training. I even subjected my own new deputies to the video training when I was still in office. I liked joking that it was an 8th Amendment violation to make them watch me do the presentations via video! But in reality it gave them a firm understanding of the philosophical foundation of our Sheriff’s Office and clearly set the expectations required of them. Many agencies are using the Police Dynamics Video Series as the foundation of their in-service training. The Dynamic of Character and the Dynamic of Authority are particularly effective for training your officers and staff, as well as preparing the next generation of law enforcement leaders. 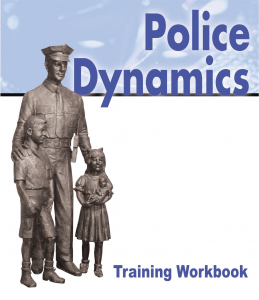 The Police Dynamics materials contained in this package will be a valuable addition to any agency’s comprehensive in-service training program. This is the primary reason I developed this particular training package and priced it so cheaply. I wanted to make a comprehensive professional development resource package available at a reasonable price so that it would fit into any officer’s budget. If you are looking to advance your career, the Police Dynamics Basic Training Package will give you a distinct advantage. Some agencies are using Police Dynamics as the basis of their promotional testing. And for anyone looking for a position as a police chief, sheriff, commander, or supervisor, the training package provides some excellent material that will prepare you for interviews, campaign speeches, public presentations, or promotional exercises. Many training officers are incorporating the principles of Police Dynamics into their own instructional programs. This reasonably priced resource will provide you with a lot of material that you can adapt to other courses. I always tried to encourage my training officers to incorporate character-based principles into their programs of instruction. Officer morale is hard to measure–but there are indicators. You know it when you see it. And perhaps more importantly, you know it when you don’t see it! Wise leaders know that performance and morale are inextricably linked. If morale is high, performance will be right up there with it. And vice versa. Police Dynamics provides tools that will help morale soar–whether we are talking about you as an individual officer or your entire department. One indicator of low morale is high turnover. When I assumed office as Sheriff of Dorchester County, I inherited a turnover rate that was over 50%. That’s right. Morale was so low that I was losing over half of my deputies every year! But after implementing some of the principles that you will learn about in this Police Dynamics program, our turnover rate went from over 50% to 0%! You heard me right! We went through a period of 14 months with zero turnover in our Enforcement Division–which is unheard of, especially in SC where turnover tends to be high. I was aware that many private sector companies that had adopted character initiatives were experiencing significant reductions in Worker’s Compensation claims, but I wasn’t convinced that it would carry over into the public sector. To my surprise, our claims dropped so low that it gained the attention of the SC Association of Counties. They actually sent a Risk Analyst to determine what we were doing to make such a dramatic impact. The conclusion: the quality of our training and the high morale. I attribute both of these to the power of Police Dynamics! And when you think about it, it makes sense. When you focus on principles like Truthfulness, Attentiveness, and Cautiousness, not only should your actual claims go down, but your false and inflated claims should decrease as well. And these are real dollars that you can use for other programs. Sir Robert Peel said that “the true measure of police efficiency is the absence of crime.” To me, this is where the rubber on the patrol car tire meets the road. If our management strategies are not resulting in a measurable decrease in crime, then we need to re-evaluate what we are doing. In our jurisdiction, the per capita crime rate went down by over 36% in the first three years of implementing Police Dynamics, and stayed there…! And before you think we were some po-dunk county with no crime, my neighboring jurisdiction on the east side of the county was ranked as the 12th most violent city in America at that time and the city on the west side was ranked second in the nation for per capita homicides. It was only out-ranked by Washington, DC! Despite this, our crime rate remained low. To put in into a greater perspective, our violent crime rate was 30% below the state average and 50% below some of our surrounding counties. Other agencies have reported similar results. The Sheriff in Highlands County, FL reported a 26% decrease in overall crime and over 80% in his highest crime neighborhoods. Now, if the crime rate in your worst neighborhood, the criminal stronghold as we call it in Police Dynamics parlance, goes down by 80%, you would expect that to correlate to a decrease in the crime rate overall. And that’s just what happened in Highlands County. Not only that, the Goose Creek Police Department, another neighboring jurisdiction of mine, adopted some of these principles right after we did and were soon heralded as THE safest city in SC. A city councilman in Fresno, CA reported to me that crime in his city dropped by over 50% after implementing Police Dynamics with his police department. 50%! Fresno had been the city with the highest rate of auto thefts. But after the crime rate dropped so low, insurance companies were actually giving discounts to car owners who lived in the city limits of Fresno. When’s the last time that happened?